In the wake of Savar and Tazreen, debate rages in garments business about whether to deepen trade ties, or take punitive measures (“39 per cent said they would probably buy fewer products produced in Bangladesh, according to a survey by Harris Poll“). Kimberly Ann Elliott (co-author of Can Labor Standards Improve Under Globalization?) argues for deeper ties, and better safety measures. “Collective action problems—where no one will move unless everyone moves together—plague the garment industry. It is a highly competitive, low-skill, low-wage, labor-intensive industry that requires relatively little capital investment and is, therefore, highly mobile. Governments are afraid to raise or enforce labor standards because investors and buyers can easily move to another low-wage country. Individual factory owners are afraid to demand higher prices for their goods for fear they will lose business. Multinational buyers are reluctant to offer higher prices because it could erode their profits and disappoint shareholders. And, sadly, many consumers seem to care more about cheap prices than what’s behind the label. 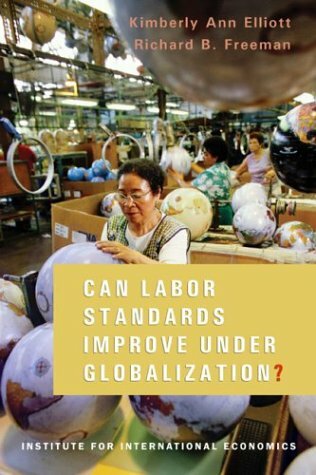 Amazon: Can Labor Standards Improve Under Globalization? FOLLOWING the April 24 collapse of the Rana Plaza garment factory on the outskirts of Dhaka, Bangladesh, which killed (at last count) 1,127 factory workers, a group of the world’s leading apparel and retail companies got together to adopt a new set of safety rules, in the hope that future disasters (this was the worst accident in apparel history) could be averted. While critics are already questioning whether this was more a public relations stunt—giving lip service to a life-and-death problem—than the real thing, it’s too early to say. In any event, several American companies, including Wal-Mart, Gap, Sears and JC Penney, have refused to sign on to the reforms, giving credence to the claim that this ambitious and binding safety agreement does, in fact, have teeth. Because the accident is believed to be the result of shoddy construction and management negligence, these highly profitable companies faced a dilemma. Fearing consumer and investor backlash, do they pull out of Bangladesh all together and set up shop in a more expensive venue, demonstrating to their customers that human life means more to them than making a quick buck? Or do they weather the storm and stay put, gambling that by signing on to a new ‘safety manifesto’ they can simultaneously demonstrate their humanitarian side while maintaining their lucrative manufacturing base? Although pulling up stakes would be a splashy public relations move, it would prove costly. Bangladesh (formerly East Pakistan) is nothing if not a source of cheap, reliable labour. Another fear was the threat of a consumer boycott, which has been discussed by various workers’ rights groups, including some labour unions. These groups believe that the only sure-fire way to get a company’s attention is by hitting them in the pocketbook. But the problem with boycotting a particular brand name or, as has been suggested, any item bearing a ‘Made in Bangladesh’ label, is that you hurt the wrong people. Bangladesh’s lifeblood is textiles. We’ve all heard of ‘company towns’ (where citizens are so reliant upon one employer, if that employer were to leave, the town dies). Well, Bangladesh is a ‘company nation.’ Without jobs in apparel factories, people’s lives would not only be damaged, they would, without exaggeration, be ruined. And if this proposed boycott were anywhere near successful, factories would be shut down and jobs lost. Alas, the West Coast boycott worked too well. Scott’s sales soon declined to the point where they were forced to shut down two facilities, resulting in the lay-off of several hundred union members. Even though the plants were eventually reopened and manned-up to previous levels, the economic damage done to working people and their families couldn’t be undone. Also, let’s be clear. It’s very hard to pull off a successful boycott. Unless, you can present a genuinely compelling narrative, one that has enormous drawing power and resonates with consumers across the board, it ain’t going to work. People simply don’t like to be told what not to buy. They either resent it or remain indifferent to it. In the 1990s, we launched a boycott of Snapple beverages after learning that it was a major sponsor of Rush Limbaugh’s radio show. While the boycott was, admittedly, poorly conceived and hastily put together, we were nonetheless stunned when people defiantly announced they now intended to purchase Snapple products—even though they’d never bought them before. Why? Because we told them not to buy them. Go figure. If the question is: How do we insure that Bangladesh textile factories are safe? then the answer is: You get yourself an incorruptible, on-site champion of industrial safety. Someone whose sole concern is the welfare of working men and women. In short, you get yourself a union. Bangladesh desperately needs labor unions. Simple as that. CounterPunch.org, May 20, David Macaray, an LA playwright and author, was a former union representative.